Testimonials — Jewelry Exchange Co.
Van at the Jewelry Exchange Co. was great! I took my fiancé there to pick out her engagement ring and Van helped her pick out exactly what she wanted. He has great inventory and beautiful diamonds. He spent as much time as we needed with us and we never felt rushed. We had such a great experience we went back to get our wedding bands. Highly recommend Van at the Jewelry Exchange Co.
Van is the man! He made our engagement ring selection and purchase an excellent experience. He is extremely knowledgeable and takes the time to explain everything without pressuring you. He was even able to a handle a rush special order and get the ring to me so I would have it in time for the proposal. I highly recommend him! Van made my engagement ring shopping so easy! He is extremely helpful with explaining all the details of the rings and diamonds. He has taught me so much about the diamonds during my shopping that none of the other shops even bothered explaining. He ensures customer satisfaction and builds the trust which is essential. I am and will recommend Van to all my friends and family. He is truly the best at his job. If your planning on purchasing a piece of jewelry for yourself or for someone else very special, make sure to visit Van at the Jewelry Exchange Co. in San Francisco. I recently purchased a diamond ring for my girlfriend. After exhausted research, I chose the Jewelry Exchange Co. because Van's product knowledge, selection and quality was far superior to his competition. All of his inventory is very high-end and quite unique. This is someone you can truely trust when it comes to purchasing jewelry. I feel very fortunate to have found Van and the Jewelry Exchange. I had an excellent experience recently when buying an engagement ring. Van was patient, taking the time to explain all the nuisances of choosing a diamond/ setting answering all my questions and giving me a thorough education. Not only quality service, I received quality product for a great price. Much better value than what you'll get at a big box store or corporate jewelry store. My fiancee and I will be repeat customers, for sure. I love this guy! My husband and I came in about 20 minutes to closing just to browse for engagement and wedding rings and Van was super nice and very patient. He showed me the cut I initially wanted and also some similar ones he thought I might like. He didn't rush us or try to talk us into more expensive rings. He made the whole process very comfortable, it was like working with an old friend. And we actually ended up buying the engagement and wedding rings that same day. He was also able to have them ready in less than a week. And they have interest free financing for the first 6 months which was a plus. Definitely recommend this place! Van is the man! He's a pleasure to work with: accommodating, knowledgeable, funny, and incredibly dedicated to his customers. I highly recommend coming to see him for your next purchase. Will definitely be back for more! I cannot say enough about how good our experience is at the Jewelry Exchange Company. Van is a jewelry expert and provides exemplary service. A key difference that separates Van and the Jewelry Exchange Co. from others is attention to detail and his integrity. 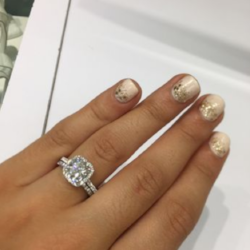 From working with us on stone selection to the ring setting, Van is extremely helpful and worked with us to make the absolute best selection and decisions - educating us along the way and offering options based on what we were looking for, rather than trying to oversell us. Van is a man of very high integrity and we confidently trust him. If you are looking for a trusted jeweler with high integrity and the very best in quality jewelry - there simply is no better than Van and the Jewelry Exchange Company. My fiance and I visited every single jewelry store in San Francisco, so we have done the work for you. The Jewelry Exchange is THE BEST place to buy an engagement ring. We wanted to get my engagement ring from someone who is knowledgeable, professional, and trustworthy. Van exceeded these expectations. We weren't able to make a weekday appointment because of our busy work schedules but Van accommodated us on a Saturday. At every other jewelry store we visited, we felt rushed. Van, however, took his time to review with us everything we needed to know about finding the perfect engagement ring. He makes his clients feel as if they're his top priority. He worked relentlessly to secure the perfect emerald cut diamond for me (they're hard to find!) and created the most beautiful custom setting for it. I will be coming back to see Van for a custom wedding band soon! I love my ring. It truly is a dream come true. I want to thank Van from the bottom of my heart for making this a seamless experience for us. Van created the most beautiful earrings I've ever *seen,* let alone owned. My husband came to him for help on my 30th birthday and together they designed a pair of absolutely gorgeous rose gold earrings with two morganite stones each. I am obsessed, to put it mildly. My husband said Van was an absolute joy to work with, a perfectionist and very timely. We will be going to him for all future jewelry needs and design. Incredible work!!! Van is a pleasure to work with. He is extremely professional, personal and polite. He listens to your needs and doesn't try to push you in any sort of direction unless you need the advice. He remembers his clients by name and that's very impressive. I went to him last year for a custom ring, after trying a few other places but didn't have good experiences. Working with Van was a breeze. The best part is that his cost was right where my budget needed me to be, so that worked out too. I would absolutely recommend that you try Van out when looking for a ring. This review is long overdue, but simply put Van is the man. I was looking for an engagement ring and expected to shop multiple stores, but my search began and ended at the Jewelry Exchange. I made the drive from San Jose to pay Van a visit and I'm glad I did. He was very patient and honest from the start. He explained what to look for in a diamond, showed me a variety within my price range, and helped me find the perfect setting. I felt he was honest when asked for his opinion and he didn't try to upsell or persuade me towards any particular style. He didn't rush me into a decision and it left me feeling confident with my choice. But most importantly, my fiancée is still gushing over her ring 10 months later. She has never met Van or set foot in the store, but she insists that we go nowhere else but the Jewelry Exchange when we're ready for our wedding bands. So if you're looking to purchase jewelry, do yourself a favor and go see Van and his team at the Jewelry Exchange. Thanks Van, we'll be seeing you soon! I don't know what an engagement ring buying experience is supposed to be like but Van made mine amazing. He was super patient in explaining all the different options available and really helping to narrow down what kind of ring we wanted. In the end, he worked within our budget and we've got a beautiful ring to show for it. He custom makes the setting so anything we wanted to change, he could and did. Van is very responsive (whether you decide to email or to call) and I never felt out of the loop. Highly, highly recommend buying your engagement ring from here. You're spending a lot of money and you should feel secure that you're getting not only a good deal but great quality and service, too. This is a review that is long, long overdue. 4 years ago, I was in need of an engagement ring. I had something in mind that I wanted, and could not seem to find it anywhere. I actually had a lot of ideas of "If I was a millionaire, here's the totally custom idea I have that would be perfect in every way." I was hoping to get just a few of those ideas in a ring that was sitting in a glass showcase somewhere. After going to far too many jewelry stores from malls to shifty "independent" locations, I found my way to this building on Utah St. I looked through everything they had in stock, and while it was quite impressive, it wasn't what I was after. I'd tried to describe what I was after to so many people before and gotten nowhere, so I thought I'd try again. All three of the people working there were interested in my design and had practical knowledge on how I should go about building it to improve what I wanted. When we started talking about a fully custom ring like this, I assumed the price was going to be way out of reach but much to my surprise, it was very reasonable. Long story longer, I picked out a stone, they made the ring and setting and it all came out perfectly. I was even able to pick out little details like how many accent stones there would be on each part of the ring and such. It was perfect. I couldn't even wait to give it to my future wife, and she refuses to take it off for almost anything. She loves that I designed it and it's so special to her. I can't say enough how great the whole experience was. If you're looking for a really great and caring bunch that can get what you want done for a great price, you've found it. I've been a customer of Jewelry Exchange San Francisco since 1995. Van and his staff are very knowledgeable, honest, and welcoming. They strive to make you feel at home. My wife and I trust the quality of the stones, craftsmanship, and above all the fair pricing. If you're looking for something one of a kind, custom made, or upgrading your current settings, Van is the Jeweler for you! The money you spend here on an engagement ring, anniversary necklace, birthday earrings, or that spur of the moment gift for your loved one, will be worth it. I highly recommend Jewelry Exchange for all of your families jewelry needs. I normally do not write Yelp reviews but I felt compelled to write a review for my experiences with Jewelry Exchange Co. My first experience with Van Mardirosian (owner) was 11 years ago when I just became engaged. My then fiancé and I had been searching for the 'perfect' diamond for almost 3 months. We had searched several jewelers and just didn't feel like we found 'the one' until we met Van. After our initial meeting Van immediately knew we were serious customers with a very specific taste and expectation. He listened to what we wanted and showed us to the diamond that he felt met all of our needs. The bonus? His pricing was SPECTACULAR! No one could even come close, and trust me we shopped enough places to know. So we not only bought the engagement ring, but we also purchased our wedding bands, a Cartier watch, and a diamond ring for my mom! Most recently I wanted to upgrade my ring based on a picture I had seen online. Now, I know that it sounds ridiculous to show a picture and expect the real life results to be the same, but that's exactly what happened. Van met with my husband and I for well over an hour to thoroughly and patiently explain exactly what I would be getting based my online picture. The outcome? Just the most beautiful ring that I don't even want to take off, even at night! We also purchased some earrings from him that was priced so competitively it was hard to say no! Van is a family jeweler that I will be going for all my needs. What sets him apart from the other jewelers is his honesty, his patience, and his expertise. He truly will not be satisfied unless you are. He is willing to work with you to give you exactly what you are looking for no matter what your budget is. I can't give enough stars to Jewelry Exchange Co.! Thank you for always putting a smile on my face! Van was amazing! My fiancé and I went to many jewelers looking for the right engagement ring for me. Van was very patient, knowledgeable and fair in his price for a quality engagement ring and wedding bands. I definitely recommend the jewelry exchange and wouldn't waste time going anywhere else! View more of our over 150 of our 5 star reviews on Yelp!